The 43mm 99-UVBTS Brass UV Filter is Chiaro’s top-performing protective UV filter offering 99% light transmission. It’s ideal for photographers who demand the highest-quality glass and other essential features for uncompromised image fidelity and premium construction. To achieve superior 99% light transmission, Chiaro uses highly-polished Schott glass, multi-coating, and additional advanced elements that improve the filter’s light transmission. A scratch-resistant coating minimizes scratching of the glass and helps assure that water, oil, dust, and fingerprints are removed with a gentle wipe. 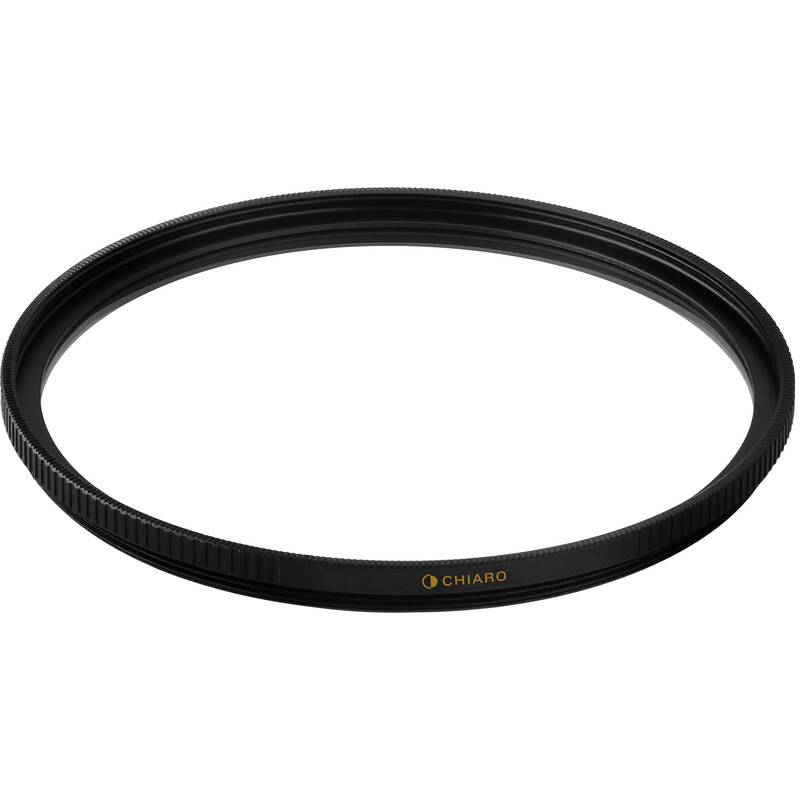 The durable brass filter ring is designed to screw on and off effortlessly, and it’s thin to prevent vignetting when used with wide-angle lenses. Side knurling is crafted to help ensure that you’ll have a firm grip when attaching or removing your filter. Protecting your lens doesn't mean you have to lose optical quality. By using highly-polished Schott glass and advanced coatings, Chiaro can offer a 99% transmission rate, which is the highest possible transmission rate for glass. And the company verifies the ratings with ISO certified lab testing. Glass that's polished to perfection is essential to achieve a high level of light transmission. The Schott glass in this Chiaro filter is highly-polished for flatness that ensures superior optical clarity. The durable brass filter ring offers a substantial, premium feel. The unique properties of brass minimize the chance of jamming or binding when you're screwing the filter onto your lens or stacking filters. Box Dimensions (LxWxH) 4.1 x 3.3 x 1.0"
43mm 99-UVBTS Brass UV Filter is rated 4.5 out of 5 by 50. Rated 5 out of 5 by Anonymous from Protect your glass with Chiaro 99% light transmission so no loss of image quality - check Brass filter ring prevents sticking to lens & other filters - check Knurling - which I never knew about until I bought this filter but absolutely love - easy on/easy off - check Multi-Coating - prevents flare and loss of image quality - check Glass - Polished Schott B270 - some of the finest glass you can use - check! Rated 1 out of 5 by Jim from Caused Distortion and Erratic Camera picture auto-settings I am using this with a purchase of used Canon 16-35/2.8 L II USM AF with my Canon 70D. Because the UV filter and the lens were purchased together, I immediately used the UV filter with the lens. My pictures had significant distortion at the 16 mm focal length and some times the camera would decide to do a 1/4 sec exposure on a flash photo (clearly not needed) and other quirky picture settings. I took the setup to the local high end camera store and they figured out the filter as the problem. In all fairness, this L lens even has distortion issues even with high end $100 filters. I am ending up using no filter based on these results. Rated 5 out of 5 by Floyd from Great Quality Glass I've just started using some of Chiaro Filters after reading a review back in 2016. They are a newcomer to the Filter business but they hit a cord with me with their philosophy...?Chiaro focuses purely on the percentage of visible light that passes through the filter unharmed. ?I wanted a filter for my new Lumix 100-400mm Tele. This is an expensive lens with some of the best glass made. At these focal lengths light transmission is very important. I bought this Chiaro because of it's 99% light transmission. Best decision I made, it is slim, only 3.2mm so no added bulk. I like the dual Knurling grooves on the top and side, makes it very easy to add or remove. Solid Brass construction and SCHOTT Glass. I'll be buying more Chiaro Filters from now on. Rated 5 out of 5 by Steve from Chiaro 99-UVBTS95 Screw On UV Filter Chiaro 99-UVBTS95 Screw On UV Filter First impression is its weighty, and has heft. To me this is a solid piece of crafted glass optics. The treads are of brass so none of that sticking issue like inexpensive filters. This is 99% UV Filter and this filter is crystal clear out to the edges. In many difficult scenes like water and snow where flair is obvious and sun glare comes into play the images are spectacular and extremely crisp. The multi coat and with the scratch coat to resist water, oil, and dust is a constant with all better quality screw on lenses. The slim design of the knurled edges are enough to screw on and off easily. Even the box it arrived in was a class act. This UV Filter is a keeper and the first of many for my many lenses I own. Rated 5 out of 5 by Anonymous from I'm updating all my UV's to Chiaro! I used to be a B+W guy but I am very impressed with the quality and honest Schott glass from Chiaro. I'm in the process of updating all my lenses to Chario 99-UVBTS filters. Love the brass rings which don't stick and the image quality is not compromised. I even love their packaging - which is very well designed, full of good info, and love the interior plastic protection where I can store extra filters on the go...or save my old filters that I'm no longer using. Rated 3 out of 5 by Anonymous from Seems to be of good quality, this copy may be defective I Placed this filter on a brand new canon 100-400 mkii L lens, pictures were totaly unacceptable. Blamed it on the lens, brought lens to canon factory service, told them if this is Canon L quality I would be switching to Nikon, Left the len there for repair. After keeping the lens and my body for 7 days it was noted they checked lens resolution and auto-focus calibration and all was in spec. I took the lens home assuming i would be returning shortly to Canon service, took a few shots and to my surprise all was well. Then I realized they returned it with out my Chiaro filter. Called and had it mailed back to me, put it on the lens, and resolution turned to garbage. Either this filter, is defective or this lens does not like this filter, I don't know which one. this is the reason for 3 star rating. The filter looks to be of excellent quality, I will give it another chance and try again on next new lens, but not on 100-400. I have ordered a different brand uv filter but have not received it yet for trial. Rated 5 out of 5 by Anonymous from High quality filter for professional level lenses UV filters are essential pieces of equipment in my opinion, but quality is very important. When I buy high end lenses, my investment is in the quality of the glass, and while UV filters protect the glass, they can also compromise image quality. That is not the case with the Chiaro 99-UVBTS UV filter. I've used this filter in a variety of lighting conditions and have been very pleased with the resulting images, both in their color and clarity. The brass construction and side knurling on this filter make changing filters effortless. With it's high light transmission (99%) and solid construction, the Chiaro 99-UVBTS does its job while allowing me to do mine as a professional photographer wanting to produce top-notch images. Rated 5 out of 5 by Nasshorn from Quality at Economy price My photos are very important to me as is my equipment.? I do keep filters on my lenses to protect them and have had filters that really disappointed.? I've gotten in the habit over the years of purchasing only higher quality filters (at the best price I could find) so that they were not degrading the images.? When I saw this Chiaro filter I was, at first, skeptical because of the price, but as I read the glowing reviews I decided I'd give it a try.? When I received the filter I immediately went out and took a few test photos, put them on my large monitor and zoomed in to 200 and 300% as well as full screen etc.? I could not see a difference between the naked lens and the filtered lens shot.? In the past I've had filters that were very hard to thread on or off.? These threads are precision and smooth.? The glass is tight in the brass ring, as it should be.? I am giving this a five star rating, because in my tests it deserves it as there were no negative issues and I consider the value price to be a great bonus.? In? the future the Chiaro filter will be my first choice for the combination of quality and price that I have not seen any other brand equal. Will this filter fit on the sigma 35 mm f/1.4? Does this fit the Canon EOS 5D Mark IV 24-105mm lens? Yes, that's what I have it on. Will the lens hood for the Lumix 100-400 Telephoto fit using this filter? Yes, I use it on my Lumix 100-400 wihout any issues. Where or what country made this filter? I know B+W is made in Germany and it clearly states it on the product. Made in China. Good thing B&amp;H told me because I tried to contact the company to ask them and received no response. Going back to B+W or Hoya.